Its been long since i made something sweet for myself. When i say sweet, it is not one of those sugar-laden desserts, i prefer less sugar in my cup, not only me everybody in my family, prefer less sugar. 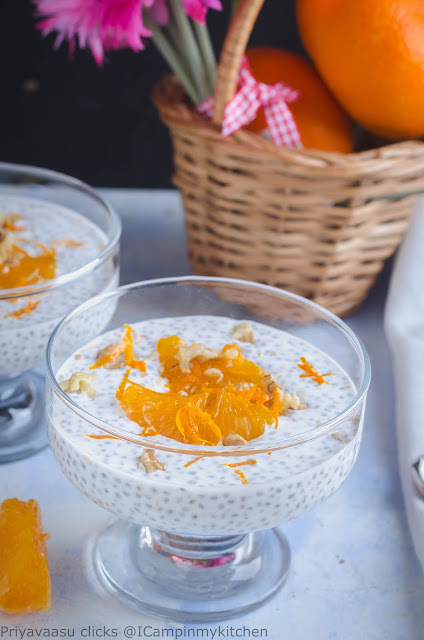 While thinking what to make, i remembered my Mango-musk melon chia pudding, with mango season arriving, this will definitely make appearance in our menu. In fact i have few Badami Mangoes ripening in my rice pot, i just smell them everyday to feel that energizing aroma of ripened mangoes!! While going through my bookmarks folder for some inspiration, i landed here. Once i ticked all the ingredients in the list, I got to work immediately. It takes absolutely no time to make this pudding. Just dump everything, shake and refrigerate. After few hours, you have something sweet, delicious to snack on. I made this pudding vegan with coconut milk, and haven't added any sugar at all, we prefer it this way. 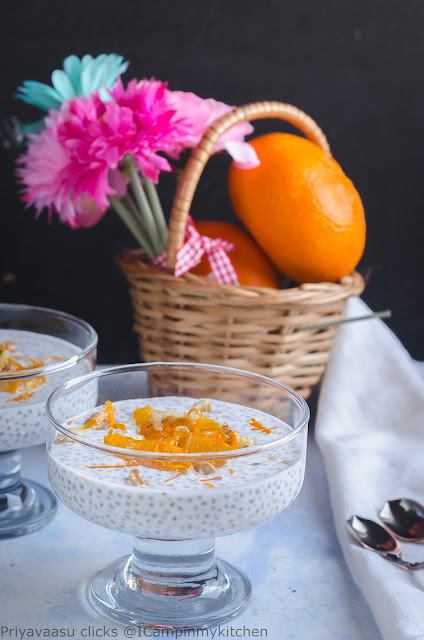 Coconut milk itself, gives a sweet taste to the dish, and the orange segments added to it. Vanilla is what flavors this pudding and I would definitely recommend using a vanilla bean, it gives an amazing feel to the dish, if you don't have one, go on and use extract or flavor it some other spice you prefer. This recipe makes one single serving pudding for breakfast or 2 servings if served as a snack or dessert. I used a bottle to soak up the chia seeds in coconut milk. Why bottle? 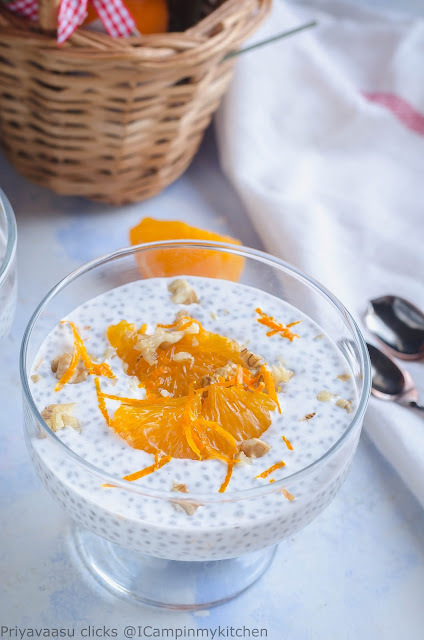 it is easy to shake, to break the gelled chia seeds, i feel it is a bit messy in a bowl. So, use a bottle with lid, so you can give a nice shake, shake before serving. Take chia seeds in a bottle, i used 200grams empty nutella bottle. Add coconut milk and orange zest to it. 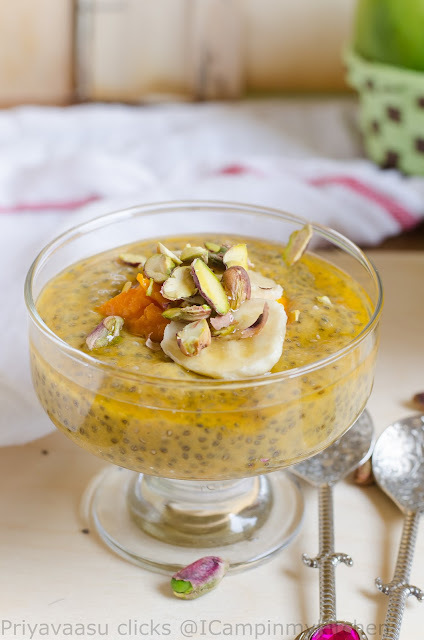 If using vanilla pod, cut open it vertically, scrap the seeds using a sharp knife, add that black gold to chia seeds. If using vanilla extract, add it now. I prefer vanilla pod, i used the last pod from my stash for making this pudding! Now give the bottle a good shake.using a spoon stir well for the ingredients to mix well or else the chia seeds will settle at the bottom and not gel well. Close the lid and let it sit in the fridge for a good 4-5 hours, overnight will be even better, the flavors will marry and mingle so well. 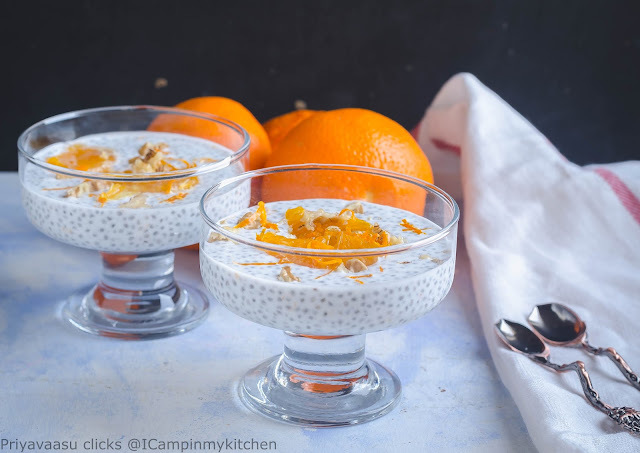 Before serving, get the garnishes ready, spoon the pudding in 2 serve bowls, top it with fresh orange segments, zest and chopped walnuts. Serve immediately. If serving for breakfast, just add all the toppings to the bottle and enjoy. It serves 2 if served as dessert or snack and one if served as breakfast. Chutney and Thogayals, my lunch is never complete without these. I try to make a small batch everyday just for 2. 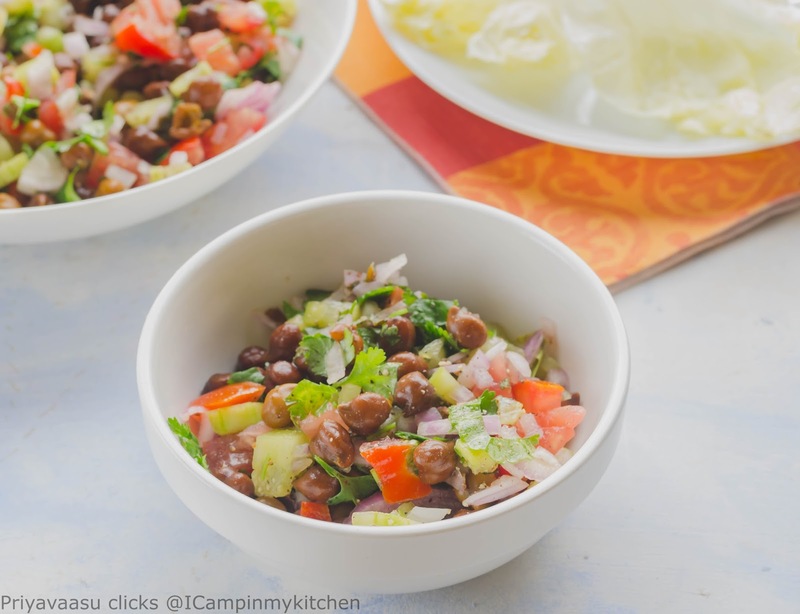 I feel they are a complete meal, with dal, greens and if you can incorporate veggies in them, it is more nutritious. I have lot of thogayals and chutneys with veggies like Beets thogayal, Ridgegourd thogayal and tindli thogayal and greens thogayal like fenugreek thogayal, brahmi leaves thogayal, tusli thogayal and now this thogayal is another add to that healthy list. 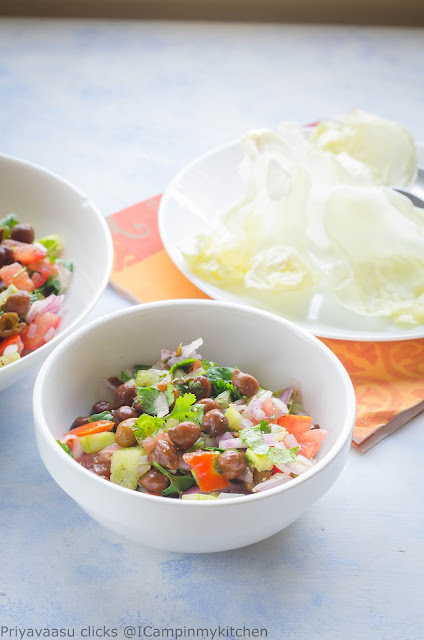 The main ingredients in a thogayal/chutney are urad and chana dal along with tamarind. 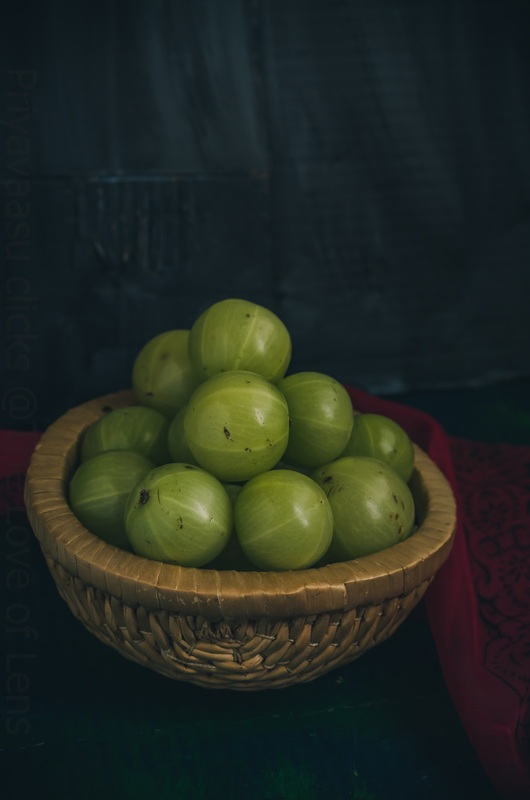 But this recipe, doesn't have tamarind in the list, since we are using gooseberries which are sour in nature, we can avoid tamarind. Do not skip coriander seeds and sesame, as they add a nice texture and flavor to the thogayal. 2 nos carrots. peeled and chopped into thick roundels. Heat a kadai/pan, dry roast urad dal, chana dal, white sesame seeds, black peppercorns, and coriander seeds, until the dal turn golden brown. Take care not to burn them, keep the flame simmer. Switch off the pan, and add red chilies to it. Tranfer the contents to a flat plate. In the same pan, add a tsp of oil, add chopped carrots and gooseberries to it an saute in a simmer flame for around 4-5 minutes, for the veggies to sizzle. Take it off the flame. Let it cool completely. 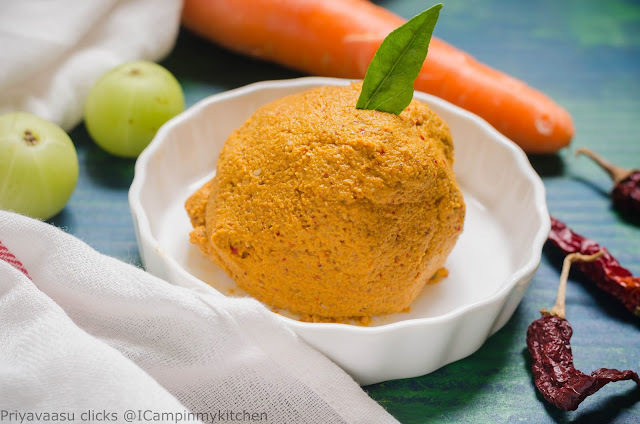 Take the roasted ingredients and veggies in a mixer, add salt and grind it to a thick paste using as little water as possible, If the mixer stops while grinding, add a tbsp of water and use a spatula mix well and grind again. Once done, remove the ground thogayal to a clean bowl. 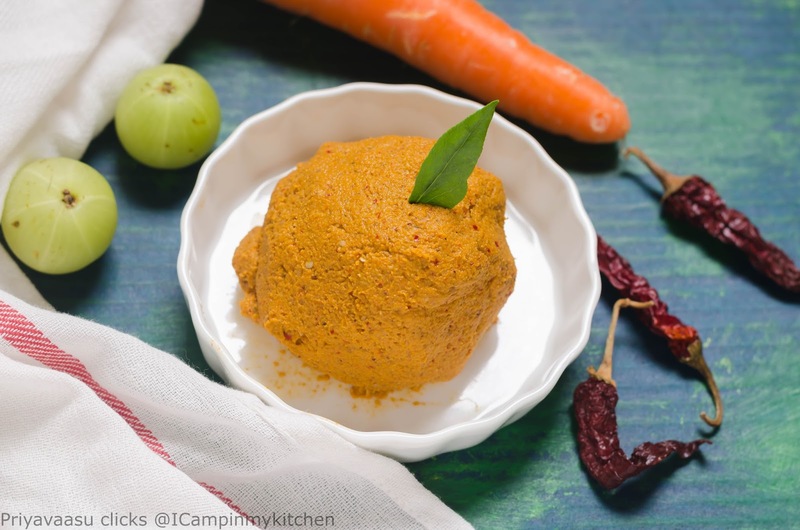 Serve it along with steaming hot rice and ghee/sesame oil. It took me almost 2 weeks, to post this recipe. For reason unknown, i didn't touch my laptop or my camera all these days. Not touching laptop, can be considered healthy, but camera, that is total disaster. Signs of no creativity, brain-block, clogged mind and soul. I needed a drain remover to flush out my body and go touch and feel my camera again. It is not like i create stunning photos, but i keep in touch with my other side of brain and slow my aging and brain rust! These 2 weeks i feel like i have aged 10 years. I finally broke out of that tight chain, clogged drain and took my camera out and whipped my lazy bum, to shoot some pictures yesterday. Coming to the recipe, there isn't any here. A simple salad, served in a funky way. 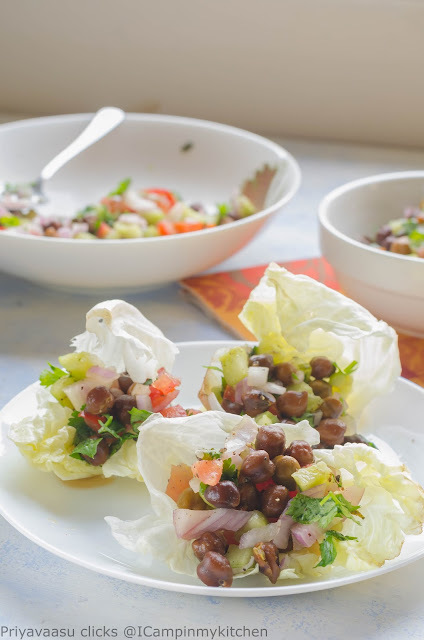 It will definitely brighten your party table, serve it as an appetizer or part of a filling meal or just a light dinner to satiate your system after a heavy lunch. Whatever it is, this salad sure will delight your senses. When i posted the picture in instagram, one of my friends tried it and gave me a thumbs up. A simple recipe, just boil the chickpeas and toss it with rest of the ingredients. 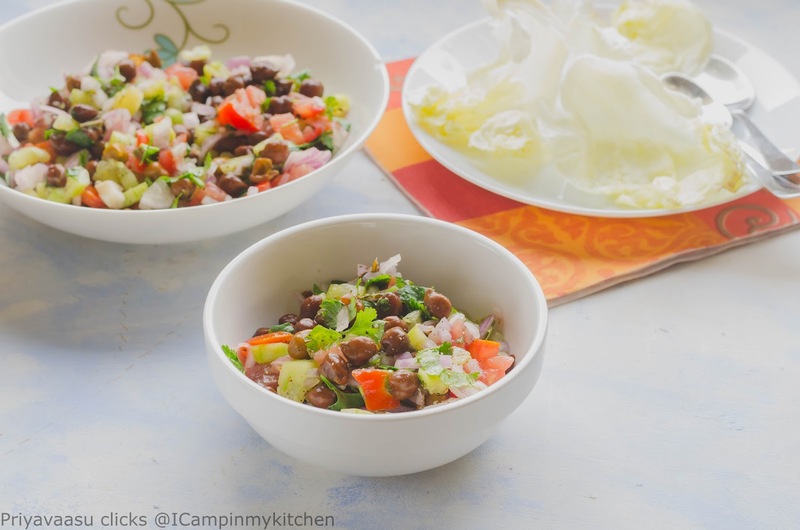 Take boiled chickpeas in a large bowl, add finely chopped cucumber, tomatoes, chili and onions to it.Toss well. Remove the seeds of the tomatoes before chopping it. Add finely chopped mint, coriander leaves to it. Top it with pepper powder, black salt ,chat masala , lemon juice, and toss everything together. Chill it in the refrigerator for 15 minutes. 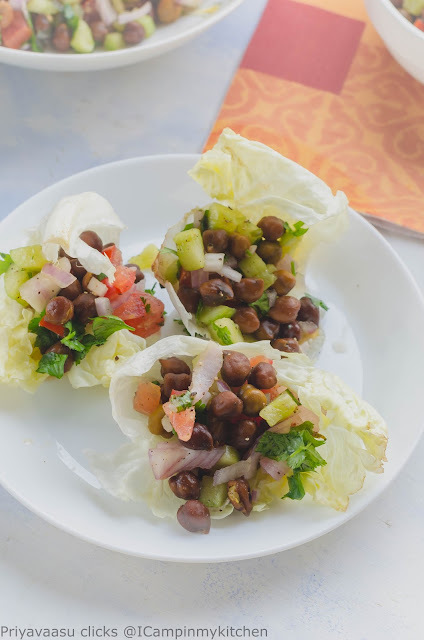 To serve, place lettuce leaves on serving plates, top each leaf with generous 3-4 tbsp of salad and serve immediately.